Ballpark Estimate: $3/inch of Stump Diameter, $100 Minimum. Pour chemicals on the stump to help it disintegrate “naturally”. This will take a few decades. Try digging it out yourself. For small stumps, this might actually work, assuming you have a truck, some chains, and a friend or two who are easily bribed with beer and pizza. Hiring or renting a stump grinder. If you want to try one of the first three options, good luck and God speed! If you’re interested in stump grinding, read on. 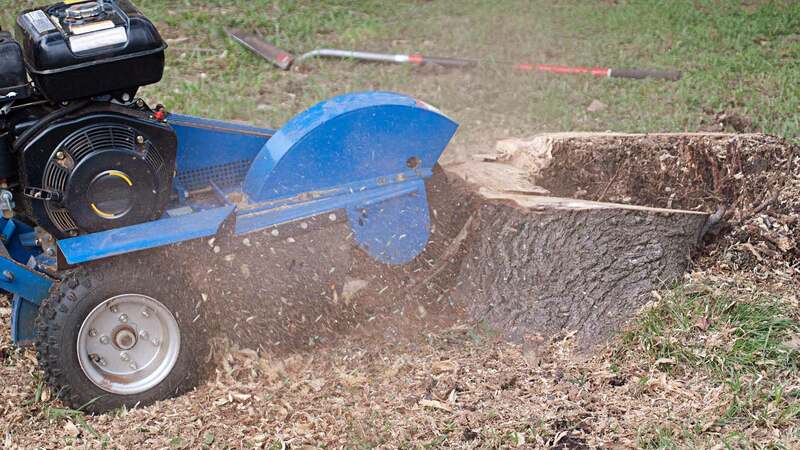 For the average homeowner’s stump grinding needs, when you call a contractor to come grind a couple tree stumps in your backyard, they’ll show up with a hydraulic 25-60 HP stump grinder like the one shown in the picture to the left. It will cost around $100 for your first stump (i.e. just for showing up trailering this machine) and then anywhere from $25 and up per stump after that, depending on the stump diameter and how old/rotten the the stump is. Assuming the same diameter, a pine tree stump that’s been decomposing for 5 years is a lot easier to turn into wood chips than an oak stump that was just cut down a week ago. Figure an average of $3 per inch of stump diameter, measured at the the widest point, grinding down to 12 inches below grade. Some companies will offer deals such as $400 for 10 stumps and $25 for every stump after that. For land clearing when there are dozens or even hundreds of stumps, you’ll need a big 100-250HP+ machine. Most jobs like this will be either a negotiated flat rate, a per hour fee, figure at least $150/hour, or a total diameter charge (e.g. 100 stumps averaging 15 inches each = 1500 stump inches at $2/inch = $3,000). You can rent a 10-16 HP self-propelled stump grinder for small jobs for a of cost between $125-$250 for a daily rental (plus delivery charges if you can’t pick it up yourself) 10 HP grinders are good for rotten stumps or small diameter stumps. However, you won’t be able to go anywhere near 12 inches below grade with these small machines.